At least 20 workers of several readymade garment factories were injured in a clash with police in Narsinghapur area of Ashulia during the workers’ demo for the seventh consecutive day on Sunday, UNB reports. 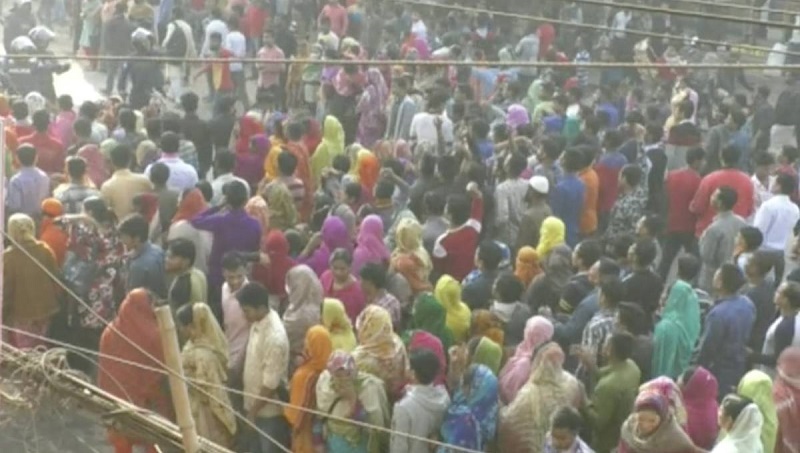 Several thousand of garment workers have been staging demonstration since January 6 in Savar, Ashulia, Gazipur and the city’s Mirpur areas demanding cancellation of ‘discriminatory wage board’ announced by the government for them. Earlier in the morning, workers of several garment factories blocked Dhaka-Tangail highway and staged demonstration, witnesses said. When police tried to disperse them, a chase and counter chase took place between them that left 20 workers injured. Besides, workers of several garment factories in Savar and Ulail areas also staged demonstration for the seventh consecutive day. Shaminur Rahman, director of Industrial Police-1, said they have urged to workers to join work. Meanwhile, a tense situation is prevailing in the area following the incident. Earlier on Tuesday, Sumon Mia, 22, a worker of Anlima Textile, was killed in clashes with police during demonstrations at Hemayetpur since the workers have started demo. So far, around 100 people including members of law enforcing agencies sustained injuries in clashes between RMG workers and police.